Beautiful Flower arrangement with Chrysanthemum Yellow -6, White -6 along with vase. Note: Same or similar vase will be delivered depending on stock. 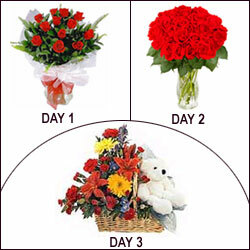 Beautiful Flower arrangement with White Glads-4 , Asiatic Lilly-1 , Pink Roses -8, carnation -6 (Yellow-3& Red-3) along with vase. Note: Same or similar vase will be delivered depending on stock. Beautiful Flower arrangement with White Glads-10 , Red Roses -5, Yellow Chrysanthemum - 2, Bird of Paradise -1 along with vase. Note: Same or similar vase will be delivered depending on stock. Beautiful Flower arrangement with White Glads-3 , Red carnation -6, Red Gerberas -3, Alestomeria-5 along with vase. Note: Same or similar vase will be delivered depending on stock. Beautiful Flower arrangement with White Glads-4 , Asiatic Lilly-2,White Gerberas -4, Pink carnation -2 along with vase. Note: Same or similar vase will be delivered depending on stock. Beautiful Flower arrangement with Red Gerberas -10,Yellow carnation -10, Asiatic Lilly-1 along with vase. Note: Same or similar vase will be delivered depending on stock. 3 Types of Flower Arrangemets with Vases Flower Vase -206 - White Glads-4 , Asiatic Lilly-1 , Pink Roses -8, carnation -6 (Yellow-3& Red-3) Flower Vase -201 - Bird of Paradise -2, Asiatic Lilly -2, Chrysanthemum White -6 Flower Vase -215 - Red Gerberas -10,Yellow carnation -10, Asiatic Lilly-1 Note: Same or similar vase will be delivered depending on stock. 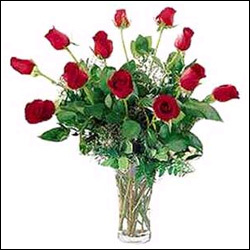 Look like you picked this lovely 15 Red roses in Vase with much love for your sweetheart.